I’m really enjoying florals as subjects right now; they’re so cheery and full of joy. I recently painted these from a little bouquet Hub gathered together for me. The one thing I will miss about summer is having lots of fresh flowers in the gardens ready to be painted! I hope you all have a wonderful Tuesday, and are looking forward to some cool, crisp air. And weenie roasts! Lots of those to come, too. Peace. Aw, thanks. And now you’ve reminded me of my mom getting so excited with the rose catalog too! I used to love the names they came up with for all the different roses. Yes I remember that. New roses every year! Nice. 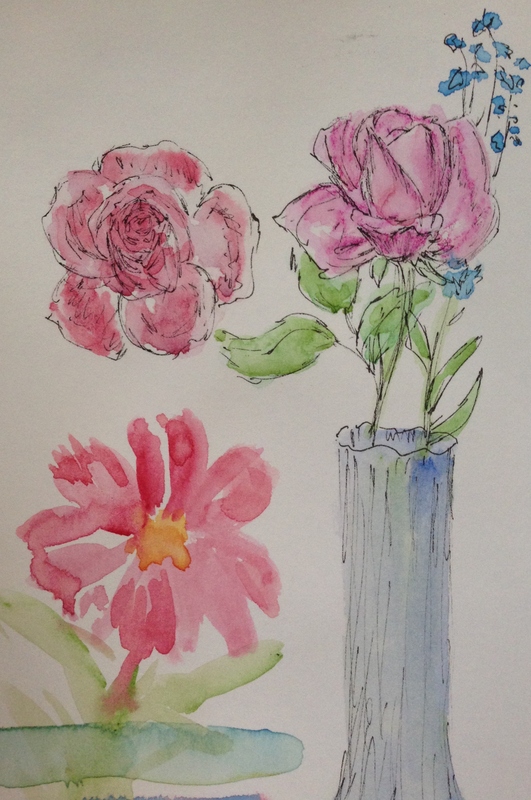 I love pen and ink for flowers. The watercolor crayons give a nice effect. You are becoming an expert with roses! Happy Day. Thank you, Kirk. Roses are a constant challenge. Sometimes a very slightly opened bud makes it easier. Beautiful rose. I am thinking of you and penny. I enjoy your flowers, too! We don’t really have many flowers around our property so I don’t bother painting them. I’m glad you’re enjoying them, Teresa. 🙂 I’ve been thinking about drawing some trees too. Much harder though. And I wish I could be as comfortable drawing/painting flowers as you are! Wow, dear Laura! Simply fantastic! Best wishes from Florida! Beautiful Laura – these are perfect for late summer. Such a cute post, your words about the cosmos flower really made me laugh! 😊 I think every painter knows the feeling of these kinds of experiments… Love your roses, they are real beauties!!! 🌹💕 But poor little cosmos is sweet too!